What’s it going to take to bridge the integration gap? Try collaboration and cooperation for a start. The momentum created by the rollout of federal initiatives such as value-based purchasing and accountable care has created the potential to transform health care delivery. Industry professionals generally agree that performance-based reimbursement models will drive providers away from the fee-for-service models that have existed for decades to one in which quality underpins everything. 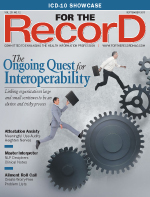 The federal push to improve interoperability over the last several years has achieved some success, but the Office of the National Coordinator for Health Information Technology (ONC) acknowledges that it has been limited in scope. In a 2012 Health Affairs article, the agency noted that, in 2010, only 19% of hospitals reported that they exchanged clinical information from health records with providers outside of their own system. Many scenarios exist as examples of how a lack of interoperability has hindered organizations from complying with federal initiatives. Consider the typical effort to form an accountable care organization, a key federal initiative that is fundamentally structured to incentivize participating health care groups for achieving an aggressive set of cost and quality measures built on improved communication, data sharing, and decision making. To increase their chances of succeeding, providers must determine how their own EHR can communicate with disparate systems found in their partner organizations. Industry professionals point out that this often requires the creation of costly interfaces, a solution that frequently turns out poorly for both parties. Then there are hospitals trying to improve performance scores under the competitive landscape of value-based purchasing. Often, these organizations must invest in advanced point-of-care clinical decision-support applications, technology that typically is not offered in a basic EHR package. And because most EHRs were not built to support integration with third-party applications, the cost for the construction of additional interfaces can become quite pricey. As the driving force behind the EHR/HIE Interoperability Workgroup, the NYeC is partnering with Healtheway, a nonprofit firm that manages the eHealth Exchange, the successor to the Nationwide Health Information Network Exchange, on a program to test and certify EHRs based on standards that enable the reliable transfer of data within and across organizational and state boundaries. Announced late last year, the coalition selected the Certification Commission for Health Information Technology (CCHIT) to carry out the testing and certification program. The workgroup’s public-private partnership features 42 technology vendors, states that include more than one-half of the US population, and Healtheway. As a result, Amato notes that the industry is on the verge of a breakthrough in two important areas of interoperability: health care providers’ ability to send and receive summaries of care within their clinical workflow and to look up patient records seamlessly across disparate EHRs. To support providers in their efforts to meet stage 2, the ONC requires that certified EHRs incorporate the Direct Project secure messaging protocol to meet the electronic transmission requirement for summary of care records. While only 16 vendors and a total of 36 products have met the requirement, the expectation is that many more will follow suit by next year. • HIE Certified Network: enables HIE-to-HIE connectivity and connection to the eHealth exchange. In addition to the collaborative efforts of the NYeC and Healtheway, other national interoperability networks have emerged. For example, Surescripts has expanded its interoperability program to include not only ePrescribing connectivity between physician offices and pharmacies but also secure clinical messaging. A newcomer to the scene, CommonWell is an alliance of leading EHR vendors that intends to provide patient record look-up services within a proprietary network. Vendors with both of these initiatives have joined the Interoperability Workgroup and committed to use its standards for health information exchange. While the industry has made progress in terms of adopting standards to promote information exchange, many industry insiders agree that the absence of a common set of standards remains the greatest barrier to achieving true interoperability. Despite citing meaningful use requirements that promote standards such as LOINC, RxNorm, and SNOMED CT as a step in the right direction, DeMuro says the industry still needs a standard EHR infrastructure to achieve success. The various definitions of what constitutes interoperability can be a barrier to the widespread adoption of standards. In a recent discussion with a provider, DeMuro made note of how some organizations believe they have almost “arrived” because they are working on information exchange with their major partners. “That’s a start, but what if a patient visits a minute clinic?” he says, adding that an industrywide EHR standard is the only answer to ensure complete patient records. In an effort to get EHRs more aligned with this concept, the CCHIT’s certification program centers on “plug-and-play” capability that will enable clinicians to view and download patient information from outside their organizations without having to go to a website. It also will lower the costs associated with writing separate interfaces for each EHR and support data aggregation for improving population health strategies. With or without an industry standard, interoperability is an expensive proposition, Greenspun says. The question becomes who will bear the brunt of the cost. Under the present fragmented system of piecing together interfaces to make disparate systems communicate, hospitals often incur huge debt, much of which is unexpected. “There are lots of different systems and different versions on the market,” Greenspun says. “Every IT environment is different. It’s complicated.” Emphasizing more extensive interoperability pushes the costs to the vendor community, where many must balance the need for interoperability against the proprietary nature of their own systems. Considering the current state of progress, some industry professionals pose this question: How big of a barrier will interoperability remain to the widespread exchange of information?